On Monday, Ken Livingstone resigned from the Labour party. He had been suspended from the party following the smears that he was an anti-Semite and had claimed that Hitler was a Zionist. This was completely untrue. As Red Ken goes on to say in the interview with RT, he never claimed that Hitler was a Zionist, only that he briefly supported Zionism. It is abundantly clear if you read Livingstone’s 1987 book, Livingstone’s Labour, that a racist of any stripe is the very last thing the former head of the GLC is. He makes it very clear that he is firmly opposed to anti-Semitism as well as anti-Black and anti-Irish racism, and details with the disgust and outrage the way the British state recruited Nazis, including those responsible for pogroms against the Jews and the Holocaust, as agents in the Cold War struggle against Communism. The claim that Livingstone said Hitler was a Zionist is an invention of John Mann, the Blairites and the Israel lobby, and repeated ad nauseam, ad infinitum, by the Conservative press and media in order to smear and discredit him. And they are still doing it. Deborah Orr, one of the wretched columnists in the I newspaper, claimed that he had said the Hitler was a Zionist, which shows how much she, and her editor, care about factual reporting. Mike has also covered on his blog how the Israel lobby continue to point to an interview Red Ken gave on Sky as showing that he was anti-Semitic. Which also shows they haven’t bothered to watch it, as in the interview Ken thoroughly refutes the allegations and shoots down those making them. In this interview, Livingstone answers the question why it has taken him so long to resign. He replies that his instinct has always been to fight on to the end, whether it was against Thatcher or Tony Blair. But he chose to resign now because the controversy and lies surrounding him were becoming too much of a distraction. He was suspended two years ago in 2016. After a year, there was another three day hearing, which couldn’t refute the charges against him, and so extended the suspension for another year. He wanted to take his accusers to court, but was told by his lawyer that it would take at least two years to get there. He considered that it was too much of a distraction from Labour’s real programme under Corbyn, which he makes very clear has a real chance of winning. When asked about whether the allegations have damaged Labour’s chances, for example, in Barnet, which has a high Jewish population, Red Ken said that of course people would be shocked when they hear that he said that Hitler was a Zionist, that it’s not anti-Semitic to hate Jews in Israel, or that Jews are Nazis, but he was struck by the number of Jews, who came up to him on the street to tell him that they knew what he said was true. This was that in 1933 Hitler and the Zionists made a deal to send some Jews to Israel. They didn’t like each other, but as a result, 60,000 Jews emigrated to Palestine. If they had stayed in Germany, they would have been murdered in the Holocaust. So it’s the lesser of two evils, according to Livingstone. When the interviewer asks him if these allegations haven’t put a dent in Labour’s electoral chances, such as in Barnet, Livingstone tells him that half a dozen Jews have asked him on the street why he claimed that Hitler was a Zionist. And he’s told them that he never said that. Unfortunately, Livingstone never completes that reply due to a technical fault. The interviewer then moves on to ask him if he really believes that Labour has a chance under Corbyn. Livingstone says clearly that everyone said that Labour would be wiped out during the next election. But in fact, Corbyn delivered the greatest increase in the Labour vote since the 1945 election, and they came within two per cent of the Tories. They could have gotten more, if the party had been united and MPs hadn’t been trying to unseat their leader. He states that Corbyn has excellent plans for massive public investment, improved service, creating new jobs and investing in high tech industries. That connected with people, and will connect with people at the next election. The interview ends with the question of what Livingstone will do now that he’s retired from politics and whether he will return. Livingstone states that he retired from politics after he lost the election to Boris Johnson in 2012. Now he’s an old age pensioner and a house-husband, walking the kids and feeding the dog. It’s a very, very good interview with Livingstone making it very clear that he definitely did not say what the liars in the Blairites, the Israel lobby and the press have accused him of. As for Jews telling Livingstone that they know he didn’t say those things, I can well believe this. 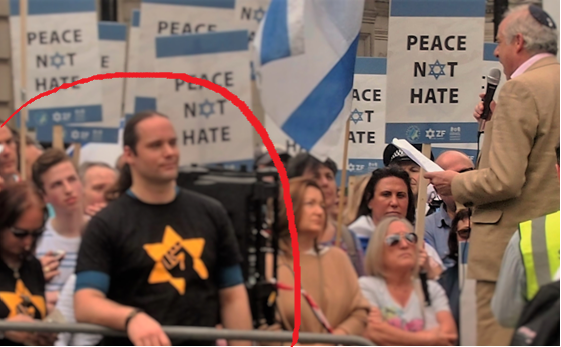 Mike has put up innumerable pieces on his blog showing the support of many Jews and Jewish groups for Corbyn and the victims of the anti-Semitism smears, pointing out that there is absolutely no truth in them. Especially as so many of those libelled as anti-Semites are self-respecting Jews. The alliance between the Nazis and the Zionists is solid historical fact, and included in respected historical studies of the Holocaust, such as that of the Zionist historian, David Cesarani. It was called the Ha’avara agreement, and there’s a page on it on the site of the International Holocaust Museum in Israel. All you have to do is google it to find out that what Livingstone said was the truth. The shame of it is that certain people will take Mr Livingstone’s decision as an admission of guilt – and that he will not have the opportunity to put the record straight. That means he is letting down others who have been put in the same situation (like This Writer). I’m not backing down – and if Labour’s disciplinary panel find against me, I’ll happily sue the party because my good name is not a negotiable commodity. It goes without saying that I’m backing Mike, and everybody else who has been foully smeared by these contemptible knaves, 100 per cent. While I understand why Livingstone has raised, I am afraid this will just serve to encourage the Blairites and the Israel lobby in their campaign against Corbyn and the true Labour moderates. They will not be placated by just taking down a few, sacrificial supporters, like Livingstone. Now that they’ve seen their campaign is effective, they will keep on and on. The best defence is attack, and the only way to tackle them is to meet them head on, and refute every one of their dam’ lies. They are not as secure as they think they are. The Blairites live in holy terror of the constituency parties deselecting them. The Israel lobby itself is becoming painfully aware that smears of anti-Semitism aren’t having the affect they used to have. And Jonathan Arkush’s own position as president of the Board of Deputies of British Jews is looking very rocky after his disgusting comments trying to cast the blame on the victims of the Gaza massacre, rather than the Israelis. The Blairites and the Israel lobby are bullies. They are in a far weaker position than they wish to appear, and are responding by smears, lies and throwing their weight around. But you can stand up to bullies, and bring them down. More ringing condemnation of the government’s attitude to the Gaza massacre from Labour’s Emily Thornberry. In this video from RT, Thornberry discusses why Tweezer and her gang declared last Tuesday they were in favour of a vote on Gaza, only to decide against it three days later. She states that the answer to this issue can be found in the statement they issued on Friday, which called for the Israelis to make their own independent investigation. Thornberry makes the point that this is a contradiction in terms, but it’s consistent with Tory policy. This is the same government, she points out, that said that the Saudis should be allowed to make their own independent inquiry into their bombing of weddings. This is the same government that said that Bahrein should be allowed to make its own investigation of the torture of nine year old children in its prisons. And she goes on to say that before the government extols the virtues of Netanyahu’s government, she will remind them of the last time the Israelis conducted an independent inquiry. This was in 2014, when four boys playing hide and seek in a fisherman’s hut were blown to pieces by an Israeli bomb. Israel conducted its own inquiry, and came up with a nasty piece of nonsense completely exonerating the IDF, claiming that the hut was really a Hamas terrorist compound. She states that that is what an independent inquiry by Israel looks like, rather than the international commission of inquiry that the government opposed on Friday, and that it is nothing short of a disgrace. Absolutely. And just as disgraceful was the response of the American news media to the murder of a group of children by the IDF. I think the company in this case was CNN, but I’m not sure. It may also be the same kids Thornberry’s discussing in the video above, I don’t know, but during the bombardment a report for one of the American news channels showed during his report a group of children playing football. Minutes later the children were all dead, killed by an IDF bomb. The reporter did his job, and included that in his report. And guess what? It led to all kinds of outrage and internal questions at his company, and he got the sack. The Israel lobby does not like the world’s media reporting their crimes against humanity, and will do everything to close them down and get their reporters the sack. I can remember when they did it to one of the Beeb’s female reporters when she unguardedly expressed her disgust at the Israeli’s bombardment of Gaza back in 2014. They accused her of being ‘anti-Semitic’. She, or one of the other reporters, also said that what provoked her comment was a group of Israelis nearby, who were making comments and celebrating the bombardment. This is not only what the Tories defended, when they abstained from voting, but it’s also what the Israel lobby – the Blairites, the Campaign Against Anti-Semitism, Labour Friends of Israel, Jonathan Arkush of the Board of Deputies of British Jews and the rest are also defending: the butchery of civilians and children. All done using the tactic of smearing those, who report and protest these crimes as ‘anti-Semites’. Disgusting. Absolutely disgusting. If not broken up altogether, as the malign, libellous and morally corrupt organisation it really is. I’ve commented already on a post Mike put up on Thursday, reporting the barrage of criticism the Board of Deputies had called upon itself from outraged citizens up and down this country. They were enraged at the Board’s comments on the Gaza massacre, and the way they placed the blame, not on the Israeli squaddies, who murdered 60 people and wounded 200 more, but on the victims. Ah, it was all the fault of Hamas, who put all the 40,000 or so Palestinians massing at the fence, up to it. After all, 50 of those killed were members of Hamas. It doesn’t matter if they were members of Hamas or not. They were unarmed. This makes their killings assassinations, which is the mark of a death squad. Which is Fascism. Also, what about the 10 that weren’t members of Hamas? They didn’t deserve to die. Not least the baby that was killed when Israeli squaddies threw a tear gas grenade into a tent. Liberal Judaism and Yachad wrote letters to the Board stating that the Board had grotesquely misrepresented their views. And ordinary, individual Jews were also incensed. One of them was the comic actor David Schneider, who said very plainly that the Board didn’t represent Jews like him. Mike opened his article with the smug face of the Board’s president, Jonathan Arkush, who he said was soon to be ex-president of the Board. Well, we live in hope. Arkush is a nasty piece of work, not least for the way he’s weaponised the anti-Semitism smears against the Labour party, and tried to make Corbyn the sole person responsible for it. It’s a lie, as he must surely know, as anti-Semitism has gone down in the Labour party under Corbyn. It’s now lower than in ordinary British society. And as Mike’s repeatedly pointed out, if you want to see real, baying racists and anti-Semites, with the vilest of views, you have to look at the Tory and Tory affiliated web-pages. But when Arkush and the Board attack the Labour party for being anti-Semitic, this is only a cover for their real concern: to stifle criticism of Israel. And the Israel lobby has been using that smear since the 1980s. So much so that the American Jewish critic of Israel, Dr. Norman Finkelstein, has described it as a machine for manufacturing anti-Semites. It’s a tactic shared and employed wholesale by the odious Campaign Against Anti-Semitism. And it was explicitly set up to stifle criticism of Israel caused by their treatment of Gaza. It’s founder, Gideon Falter, was left unnerved by the popular opposition to Israel aroused by the bombardment of Gaza in 2007 or so. He did what the Israel lobby always do in such circumstances, and defined criticism of Israel as anti-Semitic. Oh yes, in debates the pro-Israel pundits and speakers will allow that Israel should rightly be the subject of criticism where it’s justified. But in practice, any support for the Palestinians is met with outrage, and claims of anti-Semitism. Especially if you call it an apartheid state, or point out just how similar it is to Fascism or the Nazi policies towards the Jews before they embarked on the horrors of the ‘Final Solution’ in 1942. The Campaign Against Anti-Semitism hasn’t said a peep about the Gaza massacre. They don’t represent British Jewry in the same way as the Board, and so there’s no call for them to. But you can bet they’ve been watching the wave of outrage against the Board for its vile comments, and been taking notes, if not names. The Israel lobby hates even the reporting of atrocities committed by Israel or its allies. They alleged that respected BBC foreign correspondents Jeremy Bowen and Orla Guerin were anti-Semites for their reports on the conflicts between Israel and its neighbours. They were particularly upset by Bowen’s report that the massacres of Muslim Palestinians by the Christian phalange in the Sabra and Shatila refugee camps in Lebanon were committed by Israel’s allies. Alan Rusbridger, the editor of the Guardian, described in an interview with Peter Oborne in his Despatches programme on the Israel lobby how he was regularly placed under pressure by the Board demanding that he retract articles on Israeli crimes and human rights violations because they are anti-Semitic. It isn’t just the Board that needs to be investigated and reformed because of their support for the shooting of unarmed civilians. It’s the entire Israel lobby, including the Campaign Against Anti-Semitism. Their patrons, as Mike and Tony Greenstein has pointed out, are largely Tories with a history of racism and Islamophobia. And they have been principally involved with the anti-Semitism smears against members of the Labour party, in conjunction with pro-Israel organs like the Labour Friends of Israel. There have been calls for the latter group to be expelled from the party, just as there has been an internet petition on Change.org to have the CAA deregistered with the Charity Commission for being a political organisation, not a charity. It has been the Campaign Against Anti-Semitism that libelled Mike as an anti-Semite and holocaust denier just because he had the temerity to defend Ken Livingstone. Just like they’ve libelled and smeared so many other decent people, Jew and gentile, even those, who have spent their lives combating racism and anti-Semitism. Even those, who have suffered genuine anti-Semitic abuse and assault themselves. And just as many British Jews were rightly angered by the Board’s comments about Gaza, so Jewish Brits have also been annoyed by the way the Campaign presumes to speak for them. Especially when its pronouncements are made by gentiles like Luke Akehurst or Stephen Pollard, who then go on to declare that all British Jews, as Jew, must support Israel. They are rightly incensed at being told what they must believe as Jews by those, who aren’t. Criticism of the Israel lobby should not stop at the Board and its vile president. It has to go beyond, to organisations like the Campaign Against Anti-Semitism, BICOM and others. Arkush should be called on to resign for his comments. And so should Gideon Falter, and his wretched smear group be broken up for its similar tactics, libels and goals. Who Do the Board of Deputies Really Represent? Rich Snobs! Jonathan Arkush’s smear against Corbyn and Jewdas as anti-Semites also set me wondering who Arkush and his fellows really represent in the Jewish community. Arkush and various other members of the Board of Deputies of British Jews are fully paid up, true-blue Tories. So they obviously don’t represent the many left-wing British Jews. Which Arkush more or less admitted when he accused the Labour leader of ignoring mainstream Jewry. But I don’t think Arkush represents them either. I think he represents an elevated, corporate elite, which looks down on everyone else. I can remember a conversation I had many years ago with two friends of mine, who lived in a very affluent, Jewish area of London. They weren’t impressed with the people there, who were very, very clannish. If you weren’t part of their circle, you were no-one. There’s nothing uniquely Jewish in all this, despite the claims of anti-Semites. You find rich snobs in all religions and in mainstream, gentile society. I’m very much aware of the perception of Christians as righteous, sanctimonious snobs, who look down on everyone else. As a general statement, it’s utterly false, but it is true of some groups. Like the very middle class Evangelicals, who support Trump and are trying to destroy what little remains of the American welfare network. Because they see the rich, not the poor, as the truly blessed and righteous. And the religious types surrounding Theresa May and the Tory party undoubtedly hold the same views. In one of their articles, Lobster mentioned how, under the Tories, the DWP is stuffed with right-wing, largely Evangelical Christians, but drew back from calling it a conspiracy. And then there’s the general snobbery and bigotry in the Tory party itself. Like the comments about the homeless ‘They’re the people you step over coming out of the opera’. Toby Young’s sneering comments about the poor, the disabled and Blacks, Asians and other non-Whites or members of immigrant groups. As well as his loathsome misogyny. Ben Bradley and the other Tories, who want to have their left-wing opponents sterilised. That kind of middle class snobbery is rife in the Tories, regardless of religion. And it seems to me very strongly that Jonathan Arkush, the Board of Deputies of British Jews, and the Jewish Leadership Council represent the same type of howling snobs in their own community. Rich corporate types, who feel threatened by left-wing Jews and Jewish organisations, and who are doing their best to smear them as ‘anti-Semitic’. Arkush and Goldstein, the head of the Jewish Leadership Council, are snobs and bigots, who should be made to apologise for the use of anti-Semitic smears and tropes against decent people, and particularly left-wing Jewish organisations. No-one should be allowed to get away with bigotry, no matter how ‘respectable’. Not the Chief Rabbi, and certainly not the President of the Board of Deputies of British Jews. Jonathan Arkush is the president of the Board of Deputies of British Jews, who splenetically claimed that Corbyn was ‘anti-Semitic’ to spend Passover with the left-wing Jews of Jewdas and that the organisation was a nest of anti-Semitism. It’s the standard libels and smears of the Thatcherites and the Israel lobby. Anything coming from the left which challenges the Israeli ethnic cleansing of the Palestinians or other atrocities in the Middle East is immediately declared to be anti-Semitic, along with those reporting or protesting against them. This includes genuinely anti-racist gentiles and self-respecting Jews, many of whom have been subject to real anti-Semitic abuse and assault, and did lose family in the Shoah. And as Mike and a thousand other left-wing bloggers have pointed out, Arkush himself used an anti-Semitc trope when he attacked Jewdas. They were to him the wrong sort of Jews. I’ve discussed here how the trope has been used by paranoid conspiracy theorist to distinguish between the Jewish bankers, like the Rothschilds, who they see as being behind the global plot to create a one world Satanic Communist conspiracy, and ordinary Jews. And so make their bizarre and malign views seem less Nazi. And yesterday I put up a piece about how Oswald Mosley apparently told Marks and Spencer, the founders of the British department store, how he intended to do the same. He was going to whip up hatred against the poor, impoverished Jewish immigrants from eastern Europe coming into the country fleeing pogroms in their homelands. But middle class, respectable Jews like Marks would be left alone. Spencer apparently had his butler politely throw Mosley, and a dam’ good thing too! Arkush should be held responsible and criticised for using anti-Semitic tropes in his libels against decent Jews. And it shows the hypocrisy and cowed nature of the British political establishment and media that he hasn’t. But other leading Jewish establishment have been criticised for their use of similar, chilling bigoted language. A few years ago the Chief Rabbi of the British Empire, Jonathan Sacks, caused justifiable outrage when he declared that Reform Jews were ‘enemies of the faith’. It’s horrifying bigoted words. It’s the accusation that was has been used by sectarians and religious bigots of all types through the ages to justify the persecution of rival sects and religions. Protestants and Roman Catholic Christians used it against each other during the Reformation, and the Roman Catholic church also used it to justify the persecution of the Cathar heretics in the Middle Ages. It has also been used by Christian anti-Semites to justify the persecution of the Jews. The outrage was so great, that Sacks was forced to make some kind of apology, as he should. And so should Arkush for his use of anti-Semitic tropes against Jewdas and other left-wing Jewish groups. It shouldn’t matter how ‘establishment’ a person is, or how respectable their organisation. If they make bigoted statements they should be held accountable and forced to apologise. If they cannot apologise, they should be removed. Jonathan Sacks apologised for his bigotry. So should Arkush. Jewdas is an organisation of religious Jews, who put their faith into practice in left-wing politics. Earlier this month, the Jewish establishment of the Board of Deputies and the Jewish Leadership Council went berserk at them and Jeremy Corbyn, because Corbyn had the temerity to attend their Passover Seder. Jewdas themselves were pleased to have the Labour leader’s company, and were pleased that he was taking an interest in their community and its issues. But they’re left-wing, and that can’t be allowed. Not when Arkush, the President of the Board, and very many of its other leading members, are also paid up Tories. They immediately accused Corbyn of anti-Semitism, yet again, because he was ignoring the mainstream Jewish community. By which they obviously means Tory-voting supporters of Israel’s ethnic cleansing of the Palestinians. And their venom carried over to Jewdas itself. They were also accused of being a nest of anti-Semitism. It’s rubbish, of course. Corbyn has been an inveterate enemy of all forms of racism, including anti-Semitism. And Jewdas’ real crime is that they’re left-wingers, who have a different conception of the political implications of their faith than the Board and its right-wing members. They’re not the first Jews to think that way either. Jews were very strongly represented in the Russian Communist party at the time of the Russian Revolution, because the party offered to free the Yiddish-speaking working people of the Russian Empire from oppression by the tsar and capitalism. Hence they formed the Bund, one of the constituent groups in the Russian Social Democratic party, the first Marxist party in Russia. They were also strongly represented in other Marxist and Socialist, and radical socialist parties across Europe. Rudolf Rocker, the German anarcho-syndicalist, had a Jewish wife, and was strongly influenced by the Jewish anarcho-syndicalists amongst whom he lived and worked. Way back in the 19th century Moses Hess, before he became a Zionist, was also a socialist. Hess was a Jew from the Rhinelands, whose wife was Roman Catholic. I can remember reading in Sir Isaiah Berlin’s article, ‘The Life and Opinions of Moses Hess’ way back at College that Hess considered ancient Israel to be an ideal socialist state, because it put into law the abstract moral precepts of the Torah. So close has the connection between Jews and radical politics, including Communism, been that it entered Nazi ideology. Communism and the Russian Revolution were plots by the Jewish bankers to bring down gentile civilisation and enslave Whites. Mike, and other great bloggers, pointed out how the Board repeated this anti-Semitic trope when they attacked Jewdas, because they were ‘the wrong kind of Jews’. And Oswald Mosley shared their attitude towards left-wing, immigrant Jewry. I was talking to a friend of mine a little while ago about a book he’d been reading on the history of Marks and Spencer. Before the firm decided that Maggie Thatcher was the best thing to hit British politics since Disraeli and Winston Churchill, the firm had a strong left-wing ethos. Marks was Jewish and also a socialist. After spending a week on his shop floor, he ordered that his shop assistants should have proper podiatric care with Harley street specialists, and was keen that his managers should actually have experience working on the shop floor. Spencer himself was a British aristo, who was content to invest in the firm but didn’t take much interest in actually running it. One of the stories in the book is that one evening in the ’30s, Oswald Mosley came to call at a dinner party held by the two entrepreneurs. The wannabe dictator then declared how he was going to promote the British Union of Fascists by attacking the Jews. But, the fan of Mussolini and Hitler went on, they were only going to target the poor immigrants coming over from the continent. They would not touch respectable Jews like Marks. The founders of the high street store naturally weren’t impressed. According to the tale, Spencer rang a little bell to summon the Butler, and told him, ‘Sir Oswald will be leaving now. Please show him out’, and so politely kicked the Fascist thug out. It’s actually not clear if the story’s true or not. Spencer apparently denied it had ever happened. As for Mosley, he claimed that he wasn’t originally an anti-Semite, and that it was only Jewish opposition to the BUF that turned him against them. But the membership of the BUF contained very many virulent anti-Semites, who expressed their vile hatred in articles in the party’s newspaper, Action. Mosley himself had also chaired debates about anti-Semitism and the Jews between other Jew haters for right-wing groups, before he officially adopted anti-Semitism. It therefore seems to me that, whatever Mosley later claimed, he was already an anti-Semite. As a Fascist party, the BUF was anti-socialist and virulently anti-Communist, as well anti-democratic and anti-Semitic. They used to order patrols around their stalking grounds in London to defend Britain from Communists. Fortunately, the Communists, Jews and trade unionists they despised fought back and gave them a good hiding. But there is absolutely nothing implausible about Mosley having a particular hatred for poor, Jewish immigrants. Someone once said that the British will forgive anything, except poverty. Which is absolutely true of the Tories and the Far Right. And Jewish immigrants at that time would have been particularly suspected of being dangerous, left-wing radicals with in-British, continental ideas. The wrong kind of Jews, in other words. Just like Arkush claimed Jewdas were. Because they’re also left-wing. The Board has joined the rest of the Israel lobby in slandering decent, self-respecting anti-racist folk, purely out of a cynical desire to preserve the Tory party and defend Israel’s ethnic cleansing of the Palestinians. And they have done so using a trope, which, if used by a gentile, would be rightly condemned as anti-Semitic. They’re hypocrites. Perhaps the real objective should not be reforming the Labour party to crackdown on anti-Semitism. It should be reforming the Board, to make sure they really represent British Jews of all beliefs and political views. And stopping it from smearing decent people, Jews and gentiles, simply for making entirely just and factually accurate opposition to Israel’s persecution of its indigenous Arabs. Last Monday, Jeremy Corbyn attended a Passover seder with Jewdas, a left-wing Jewish organisation. Jewdas’ members are religious, observant Jews, who combine their faith with left-wing politics and activism. They were glad of the Labour leader’s presence, and the opportunity it gave them to discuss with him topics of importance to them and Britain’s Jewish community. This was, however, too much for the Tory press, and the very Tory Jewish establishment. The Board of Deputies of British Jews and one of the other organisations repeating the same smears of anti-Semitism against Corbyn and his supporters, immediately went berserk along with the Blairites and started making renewed accusations of anti-Semitism. According to John Woodcock, Corbyn was being anti-Semitic again because this was an insult to Britain’s mainstream Jews, who were being sidelined. This did not go down at all well with Corbyn’s Jewish supporters, who thought that Woodcock had a cheek as a non-Jew telling Jews what was, and what wasn’t, anti-Semitic. Corbyn’s attendance at the meeting was a private affair, until it was leaked to the press. Corbyn’s left-wing, but not far left, and so it makes perfect sense for him to seek the company and opinions of those with whom he already is in broad agreement. The Board’s complaint that he was sidelining mainstream Jews is another piece of camouflage, designed to disguise their real complaint. They have been trying to undermine Corbyn’s leadership of the Labour party almost from the day he took office, repeating the lie that he and his supporters are anti-Semitic. He and they aren’t. But he is pro-Palestinian. And as the Board and the other parts of the Israel lobby have decided that criticism of Israel equals anti-Semitism, they use the accusation to smear him and his supporters. It’s questionable who the Board represents. The Board is very Tory in composition. Jonathan Arkush, its president, is a member of the Tory party. He sent a message of congratulation to Donald Trump on Trump’s election as US president. This is despite the vocal support for the Orange Fascist from real White supremacists, anti-Semites, Nazis and the Alt Right. But this doesn’t faze the Israel lobby. Steve Bannon, Trump’s former aide and another member of the Alt Right, has been invited to Israel to attend major state events. Richard Spencer, the founder of the Alt Right, has also appeared on Israeli TV. Spencer declares himself to be a ‘White Zionist’, and looks to Israel as the model of the kind of ethno-state he wants to create in America exclusively for Whites, just as Israel is the Jewish state. For members of the Israel lobby to accuse Corbyn of anti-Semitism after this is not only false, it’s also grotesquely hypocritical. There are a number of Jewish groups and individuals, who have come out in support of Corbyn, who has a proud record of campaigning against all forms of racism, including anti-Semitism. Which is in sharp contrast to the Campaign Against Anti-Semitism, which made a racist statement that Muslims were more likely to be anti-Semites than the rest of the British population. As for the Board’s claim that ‘mainstream’ Jews were being sidelined, this seems to me to mean the Conservative-voting, establishment, business types they represent, rather than the ‘mainstream’ in the sense of the vast majority of ordinary Jewish people. And Mike has also pointed out how the Blairite’s and the press’ attack on Corbyn for meeting Jewdas is based on a distinction between ‘good’ Jews and ‘bad’ Jews, something which is itself anti-Semitic. Mike’s not wrong there. Several of the works of the conspiracy theorists I’ve come across make this distinction. Since the 1980s there have been a stream of books from the American conspiracy fringe arguing that the global corporate elite are active trying to set up a world-wide, one world Communist state. This will remove all our freedoms and effectively reduce everyone to slavery. It’s the classic stuff of the nonsense Alex Jones spouts on Infowars about the evil globalists. The main villains in this pernicious fantasy are the elite bankers, like the Rothschilds, who set up, or helped to set up, international organisations like the United Nations, the IMF and the World Bank. You can see the similarities to the vile Nazi fantasies about the Jewish banking conspiracy. Many of these books also draw a distinction between ‘good’ Jews and ‘bad’ Jews. Rothschilds did lend money to Nazi Germany, even when they were persecuting the Jews. It’s a genuine crime, and the books have a point in this criticism of the Rothschilds and the other bankers, who also gave financial support and aid to Hitler and his murderers. They also make the point that millions of Jews weren’t involved in these schemes, and were murdered by the Nazis. Which is also true. They carefully make a distinction between ‘good’ Jews – the ordinary folks persecuted and murdered by the Nazis – and the ‘bad’ Jews – the Rothschilds and other bankers – who financed the Nazis. And the same kind of distinction is also made by others on the conspiracy fringe, who also promote these conspiracy theories. I believe there have been accusations of this kind aimed very squarely at David Icke. In fact, the Rothschilds’ Jewishness is irrelevant to their dealings with Nazi Germany. They were bankers acting purely in self-interest, just like the various other big American corporations, like IBM, who also dealt with them. At the same time, there is much to criticise the IMF and World Bank for. They do act as the international representatives and enforcers of American corporate interests. Whenever a failing state in the Developing World is forced to go to them for a loan, they nearly always advise a programme of benefit cuts and privatisation, in which the companies being sold off are given to American multinationals. But this is a reflection of American capitalism, and does not come from some kind of secret Jewish conspiracy like the Protocols of the Elders of Zion. And the same is true of the bankers’ support for the UN and so on. This definitely isn’t part of a plot to create the one-world global dictatorship that keeps Alex Jones hollering into his microphone. I’ve given these examples to show how the real conspiracy theorists do make the distinction between ‘good’ and ‘bad’ Jews, just as Mike stated in his articles about this. It’s a distinction the Board and similar organisations are also making when they attack Corbyn for meeting Jewdas. Such distinctions have their basis in anti-Semitism, and show how the Board, the Tories and the press are quite prepared to ignore such concerns when it suits them. On Monday, the Jonathan Goldstein of the Jewish Leadership Council and the President of the Board of Deputies of British Jews, Jonathan Arkush, wrote a letter complaining that Corbyn had done nothing to tackle what they claimed was the rampant anti-Semitism in the Labour party, and that Corbyn had consistently sided with anti-Semites against Jews. This was accompanied of a mass demonstration outside parliament organised by the two organisations. Arkush and Goldstein’s claims are frankly lies. Jeremy Corbyn has consistently opposed all forms of racism, including anti-Semitism. He is the only MP, for example, who has been arrested for protesting against apartheid in South Africa. He also has the support of very many Jews, and Jewish organisations, who rallied to support him on social media. The real issue here, which Arkush and Goldstein’s smears of anti-Semitism are meant to cover up, is Corbyn’s attitude towards Israel. They claim he’s anti-Israel and anti-Zionist. He isn’t, but he is pro-Palestinian. But this is too much for the Israel lobby, who smear anyone, who wants justice and dignity for the Palestinians as anti-Semite. Even if they are proud, self-respecting Jews, who have suffered real anti-Semitic assault and abuse. Or decent, anti-racist gentiles, who have also been the subject of vilification and assault by Nazis. Arkush is a true-blue Tory, as well as a massive hypocrite. He himself has been very keen to meet racists and anti-Semites, when it suits his agenda. Tony Greenstein on his site has a picture of him enthusiastically greeting Donald Trump and Steve Bannon, one of the anti-Semitic fixtures of the White Supremacist Alt Right. As for the Board of Deputies of British Jews fighting anti-Semitism, Greenstein also points out that when Oswald Mosley was goose stepping about the East End of London with his Blackshirts, the Zionists were telling Jews to keep out of the way and stay indoors. I don’t blame them for it, as Fascism has always been violent and brutal, and they would no doubt have attacked and beaten Jews they found on the street. But Fascists won’t go away if you hide from them. They’ll simply carry on. Fortunately, a number of Jews, trade unionists, and Communists weren’t prepared to leave the streets to them, and fought them head on. The result was the ‘battle of Cable Street’, which ended with Mosley and his squadristi routed from the East End. I am not recommending violence. I don’t approve of it. But sometimes, it’s inevitable. And for all the claim that Mosley wasn’t originally anti-Semitic and was genuinely perplexed at Jewish opposition, he and his wretched party were. And if the Nazis had invaded, or the BUF somehow gained power, it’s very highly likely that he would have aided the Holocaust and the extermination of Jewish Brits. The Tories have, of course, taken all this as an opportunity to claim that Labour is riddle with anti-Semitism, unlike them. This covers up the fact that the Tory party has a very long history of racism and anti-Semitism going right back to the Die-Hards of the First World War. One of the other left-wing bloggers put up a very extensive list of Tory racist and anti-Semitic organisations, or racist organisations, whose membership was drawn from the Tories. Like the British Fascists. They were a bunch of right-wingers, founded by a middle-class lady, who’d been emancipated by the Women’s Suffrage Act but had a hatred of organised labour. They modus operandi was to supply blackleg labour during strikes, disrupt socialist meetings and attack left-wingers and trade unionists. They once attacked a van belonging to the Daily Herald. They weren’t really Fascists, but Conservatives, and Mosley called them what they were. He declared they were ‘Conservatives with knobs on’. He asked their leaderene what she thought of the corporate state. Faced with the notion of an industrial parliament which included trade unionists as well as management and capital, she vehemently rejected it as ‘socialism’. Which confirms how little she knew about either Fascism or socialism. The there’s the various Tory pro-Nazi groups founded in the 1930s – the Anglo-German Fellowship, the Link and a number of others, and on and on. One of the nutters involved in these groups wanted to found a group to purge the Tories of Jews. The Monday Club was riddled with anti-Semites until there was purge in 1970. But as the blogger showed, the anti-Semites were still there, still active. And while we’re on the subject of racism, why didn’t Arkush and his fellows on the Board protest against the appointment of Toby Young to May’s universities watchdog. I am not accusing Young of anti-Semitism. But he is a eugenics fanatic, and attended a eugenics conference at University College London, which certainly did include real racists and White Supremacists. Eugenics was an integral part of Nazi ideology. Quite often when Nazis and other racists talked about the ‘biologically unfit’ as well as the poor and disabled in general, they also meant non-whites and Jews. But I don’t recall Arkush and the Board making any letters of complaint or raising any natural concerns about Young’s appointment. And then there’s this election poster from 1902. Okay, so the foreign master sacking his British worker to make way for his fellow foreigner isn’t explicitly described as a Jew. But the anti-Semitism is very definitely there. It was put up at a time when the Conservatives were worried about the mass immigration of eastern European Jews. They spoke Yiddish, a language descended from the medieval German middle Franconian dialect. Hence the foreign master speaks with a very middle-European accent. And while the term ‘alien’ simply means ‘foreigner’, in the language of the 19th and early 20th centuries it was very often used to mean Jews. The anti-Semitic nature of the poster is very blatant. As you’d probably expect it to be. 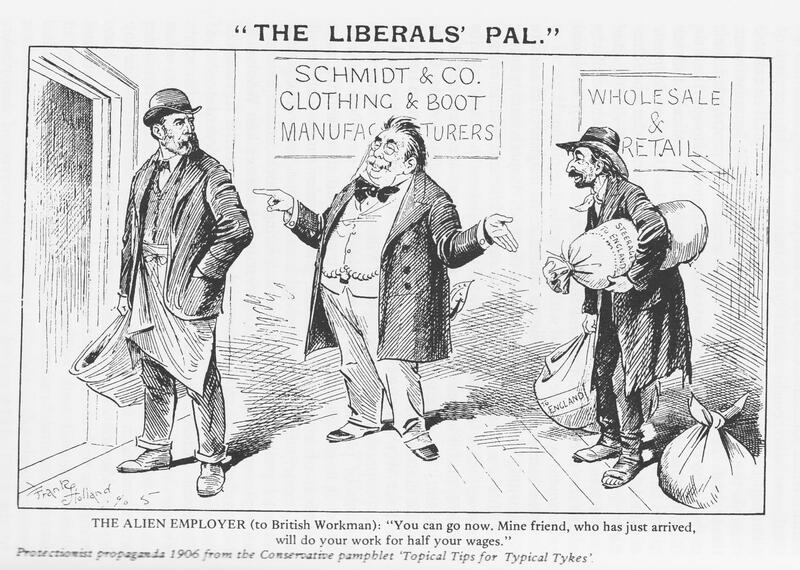 This was the era of the British Brothers’ League and other Conservative anti-immigrant, anti-Semitic organisations. But the Tories want people to forget all this, and just see Labour as a hotbed of anti-Semitism. Despite many Jews in the party having said and written that they have personally never experienced it in the Labour party. But it’s a good smear against Labour, and Corbyn, and everything he has done for Jewish Brits as well as his desire for a just treatment of the Palestinians. And that’s what Arkush, Goldstein and their friends in the Tories are really afraid of. This morning, Mike put up a piece taking a part the letter written by Jonathans Arkush and Goldstein attacking Jeremy Corbyn for being too soft on the supposed rampant anti-Semitism in the Labour party. The story’s also covered in the I newspaper, which doesn’t name the two. It just describes the letter as written by ‘Jewish community leaders’. In fact, one of them is from the Jewish Leadership Council and the other is from the Board of Deputies of British Jews. They accuse Corbyn of ignoring the issues that are important to mainstream British Jews. Their real concern, however, is revealed in their comments about how Cobyn and the Labour party under him are motivated by the Far Left’s hatred of Zionism, Israel, and the Israel lobby. As Mike has shown, Corbyn is not far left. He’s centre-left. He only appears far left compared to the Blairites and the Tories, who want everything privatised, including the NHS, following the ideological dictates of Margaret Thatcher. But then, factual accuracy is not these guys’ concern. Smearing the left and the opponents of Israel’s ethnic cleansing of the Palestinians is. Mike’s put up a couple of videos showing that Corbyn has always been an opponent of racism and anti-Semitism, so Arkush and Goldstein’s smear of him and his followers as anti-Semites is the purest nonsense. Nor is he an opponent of the state Israel. I was told this by a commenter on one of my posts about Israel and the Israel lobby, who objected to my using the term ‘Zionism’. He felt it played into the hands of those smearing the Labour leader. I am happy to be corrected. But what Corbyn does oppose is Israeli apartheid, its oppression of the indigenous Palestinians, and its seven decades long campaign to purge them from Israel. It is this, which Arkush and Goldstein are defending when the smear the Labour leader, and the other critics of Israel. They cannot defend Israel’s treatment of the Palestinians, as it’s indefensible. So indefensible that they object to anyone even mentioning it or describing Israel as an apartheid state, or comparing it to Nazi Germany, even though the comparison is apt in so far as Nazi policy went as far as 1942 and the launch of the Final Solution. And unable to describe the brutal maltreatment of the Palestinians by the Israelis, all the Israel lobby can do is try to silence its critics by accusing them of anti-Semitism. Any mention of Israeli atrocities in the press will get the journalists responsible for the article smeared as anti-Semites. I put up a documentary from Channel 4’s Despatches, broadcast in 2009 and present by Peter Oborne, which described just how nasty, bullying and mendacious the Israel lobby is. Among those they threatened and accused of anti-Semitism were Alan Rusbridger, the editor of the Guardian, and respected BBC journos Jeremy Bowen. When one of the Dimblebores attacked them for their smears, they also had the BBC investigate him for anti-Semitism. Mike states that this letter has been written to stop Labour winning the coming council elections. He’s undoubtedly right. This would terrify the Blairites and the Israel lobby, quite apart from the Tories. But the right of both of these organisations to speak on behalf of the wider Jewish community is questionable. The Jewish Leadership Council is very closely connected to explicitly Zionist groups. But it’s under something of a cloud, as its former chief, Jeremy ‘No Morals’ Newmark was embezzling money from Jewish charities. They sacked him, but decided not to call in the rozzers in order to avoid a scandal. As for the Board of Deputies of British Jews, its members are nominated by their synagogues, so it doesn’t speak for secular Jews. Nor are they democratically elected. They are also true-blue Tory establishment. They are determined to maintain themselves as the top Jewish organisation in the UK by exerting a monopoly of control over all other Jewish organisations. One of the reasons the Board hated Ken Livingstone was because Leninspart gave a small grant when he was head of the GLC to a Jewish Socialist group that wasn’t affiliated to them, and which was beyond their control. Temper tantrums and accusations of anti-Semitism followed. Their letter is also rather desperate. An increasing number of Jewish Americans are turning against Israel because of its maltreatment of the Palestinians. This includes many, who have suffered anti-Semitic abuse and assault themselves. Over here there are Jewish, pro-Palestinian organisations, that very definitely do not accept anti-Semites. But you won’t hear about them from liars and smearers like Arkush and Goldstein. Very many of the people in the Labour party, who have been smeared as anti-Semites, are decent, self-respecting Jews. And many of them have suffered real anti-Semitic abuse and attack by Fascists and racists. But because they have criticised Israel, the Israel lobby has smeared them as anti-Semitic and ‘self-hating’. A grotesque, monstrous libel. As for speaking for the wider Jewish community on the issue of Israel, at the moment something like 77 per cent of British Jews say that Israel is very important to their sense of identity. But how long this will last, if Jewish young people over here follow the lead of Jewish Americans, is a very good point. It looks like the Israel lobby is well aware of this possibility, and are starting to panic. This is simply another instance of the arch-Tory Jewish establishment smearing anyone, who stands up for the Palestinians, as an anti-Semite. Especially those on the Left. As others have shown, the Tories have a very long history of anti-Semitism and connections to real Fascist organisations. But there’s hardly a mention of this from the Israel lobby and the likes of Goldstein and Arkush. The Israel lobby’s promiscuous use of accusations of anti-Semitism reminds me of Pemberton Billing and his ‘little black book’. Pemberton Billing was an extreme right-wing Tory MP around the time of the First World War with a particular paranoid hatred of gays. He maintained he had a book with the names of 50,000 ‘devotees of Sodom and Lesbia’, who were aiding the Germans. Of course, British society back then was very homophobic. Homosexuality was illegal, and homosexuals generally bitterly hated. But Billing went far beyond the usual levels of hate and prejudice. He went off and smeared a number of people as supposed gays. And when one sued for libel, the case collapsed because Billing then accused the judge of being one of those in his book. I am not accusing Arkush and Goldstein of being homophobic. I am accusing them of trying to start another witch hunt against the Labour party using fake accusations of anti-Semitism in the same way that Pemberton Billing libelled many good people with his accusations of homosexuality and treason. This latest letter is a grotesque, politically motivated attempt to smear Jeremy Corbyn and prevent the Labour party getting into power. It shames the people the two, who wrote it, and the mendacious, biased press, who uncritically repeat its lies.